This summer, rock stars-in-training, used to practicing their roll & roll tendancies on Guitar Hero, will converge upon Greenpoint for the first ever Rock Camp. The camp isn't the only game in town. Since 2004, the Willie Mae Rock Camp has been teaching eager girls the rock & roll ropes, most recently with sessions at the Urban Assembly School of Music & Art in downtown Brooklyn. And women, too, are able to get in on the fun, with the Ladies Rock Camp, so Brooklynites can fulfill their karaoke dreams of being Pat Benetar (or whoever your reference point is). Applications are currently being accepted for all three, so don't delay (volunteers are also sought from both those musicially inclined and those who can't carry a tune). This summer, boys and girls can rock out at Rock Camp, a week-long crash course in music composition and performance that will help kids fulfill their dreams of being the next Jonas brother or Miley Cyrus. The creators just need your help in making those dreams come true. On April 26, Brooklyn Emerging Artists hosts a benefit show at DUMBO's Galapagos Art Space for the organization's first-ever Rock Camp, to be held this summer at the Greenpoint Reformed Church. 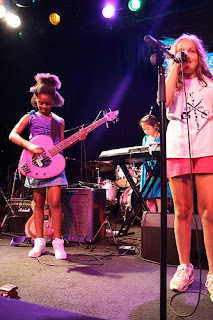 Taking a nod from the Willie Mae Rock Camp for Girls, a five-year-old summer rock camp currently housed in the Urban Assembly School for Music and Art in downtown Brooklyn, as well as the Portland, Oregon-based Rock n' Roll Camp for Girls, Brooklyn's newest rock camp is opening its application process to aspiring Mick Jaggers and Steven Tylers, as well, as they empower the city’s male and female youth through musical collaboration. Indeed, the camp encourages musicians of any level to sign up, they only need the ambition. “It’s not pie in the sky,” says Price, a Greenpoint-based musician and founder of Brooklyn Emerging Artists, a support network for the city’s many musicians, of the camp’s aspirations. To make it happen, the organizers, who also make up the all-girl country band The Havens, have been pulling from their friends in the New York City music scene to lend their skills as teachers for the completely volunteer-run camp, held this August 10-15, as well as play at benefit shows. BEA's first fundraiser, at Southpaw this past February, featured indie acts Honne Wells, Analog Transit, Jeffrey Lewis and Final Outlaw, as well as The Havens. This all-ages Galapagos show mixes things up a bit, featuring some rock acts, as well as chamber music, with prominent contemporary composer and viola player Kenji Bunch, acclaimed pianist Monica Ohuchi, Kevin Gallagher and the rock quartet The Elektrik Kompany, and Shelley Nicole's blaKbüshe, a Brooklyn-based soul rock band, on the bill. Price will also debut a new piece at the show. Rock Camp itself will be equally diverse, with an eclectic mix of genres including rock, country, hip-hop and chamber music. Of course, to do that, they need instruments, from drums, guitars and brass to violins, banjos and cellos, as well as turntables and equipment. Another need? Volunteers, from “band managers,” or camp counselors, to administrative assistants, security, on-call nurses and doctors, and extra hands at the benefit shows planned leading up to the camp. And, of course, donations in the form of money are always welcome. If that’s something families interested in sending their kids to rock camp don’t have, B.E.A. is also providing scholarships at half and full cost to those who need it. As musicians themselves, Blankenship and Price know how important the role of something like a rock camp can provide to budding guitarists and singers. “It would have been nice to have had an environment that was empowering,” says Price, a classically trained bassist who grew up in a competitive world. Brooklyn Emerging Artists Rock Camp Benefit Show will be April 26 at Galapagos Art Space (16 Main Street) from 7 p.m. to 11:30 p.m. Tickets are $12. For more information, call 718-222-8500. For more on Rock Camp, e-mail bearockcamp@gmail.com, or call 347-599-2769. The camp runs from August 10 to 15. Admission is $200, with scholarships available. Early registration, which waves 25 percent of the fee, ends May 30. The last day to register for both campers and volunteers is August 1. As these things ten to go, the sooner you register, the better.